Hi everyone...its Annie here as your host for this fortnights challenge and I thought we could play Tic Tac Toe. With so many Tim Holtz/Ranger products as well as other similar products to choose from, we would like you to pick/take a minimum of three items from the grid below, incorporating them in your entries/projects. You can choose items horizontally/vertically or diagonally, it's your decision. It's also okay to use more than three products in your entry. One more very important request........ can you please, please include the name of the items you are using within your post, not just in the link to the challenge. Country view Crafts is our regular sponsor and the challenge winner will receive a voucher which can be redeemed at their online store. We also have blog badges for our Pinworthies. Winners and Pinworthies are chosen by the DT and as well as the entry we also check that the pesky challenge rules have been met too. As always our uber talented Creative Guides have came up with more inspiration for you to view. Sometimes fate plays a hand in what you end up creating and this time was definitely one of those occasions. 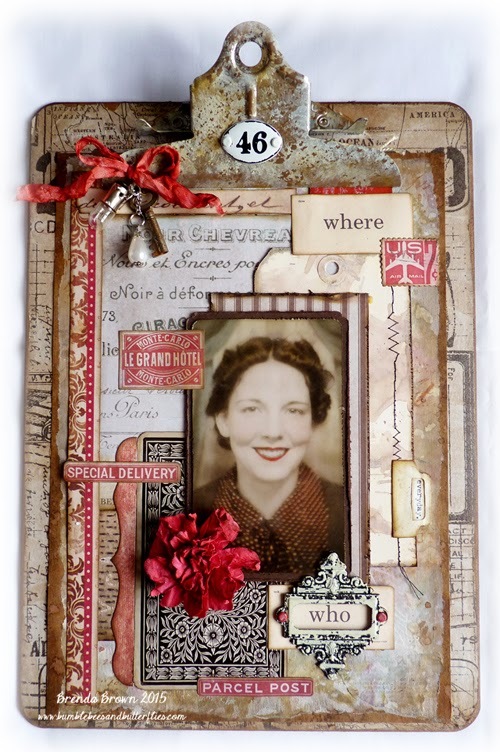 I'd already made my selection from the Tic Tac Toe grid - Sprays, Ephemera, Texture Fades - and then Tim produced his February 2015 Tag challenge HERE... based on ephemera and my favourite faux quilt look! Well it had to be done, so how did I incorporate Sprays and Texture Fades? Take a look at my blog HERE to see more. Had a great time playing Annie's Tic Tac Toe and my choice line was Idea-ology, Ephemera, Stains. Great excuse to use up some of those products I buy and forget to use! For more details, please stop by for a visit, HERE. 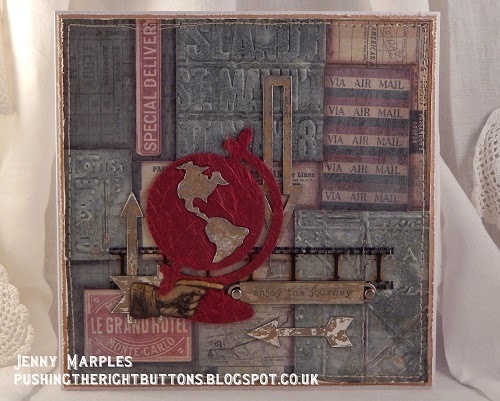 I have used one line of Annie's Tic Tac Toe chart (Ribbon/Die Cuts/Stains - and some Sprays) along with some of Tim's new stamps to create my card. If you would like to see more please pop over on my blog. I had great fun choosing which elements to use to match the Tic-Tac-Toe line combinations. I can actually cross off three lines with this altered clipboard, but maybe you could do more. Do you remember playing noughts and crosses as a child, I so loved that game. My dream destination for a long long while has been New York and I am finally going in April this year! I used the top line of the Tic Tac Toe to create this plaque - Ideology, Sprays and Ribbon/Twine. Do join me over on my blog, Live the Dream, if you want to know a little more. I had lots of fun with Annie's fantastic Tic Tac Toe board. 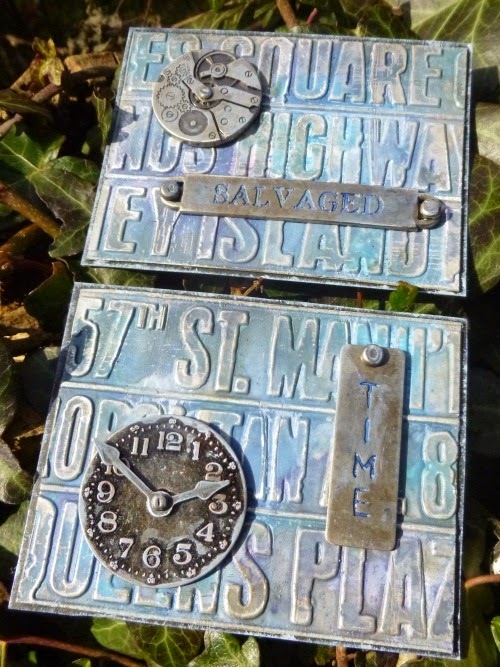 I played the first vertical line Idea-ology or any Metal Embellishment/Paints/Foil Tape and came up with a pair of weathered metallic ATCs. It was hard to capture the glint of the metal in one photograph, so do come and see some close-ups over at Words and Pictures. 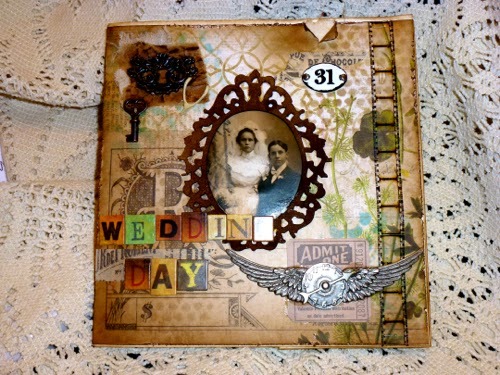 I have chosen die cuts, stains and twine for the challenge. 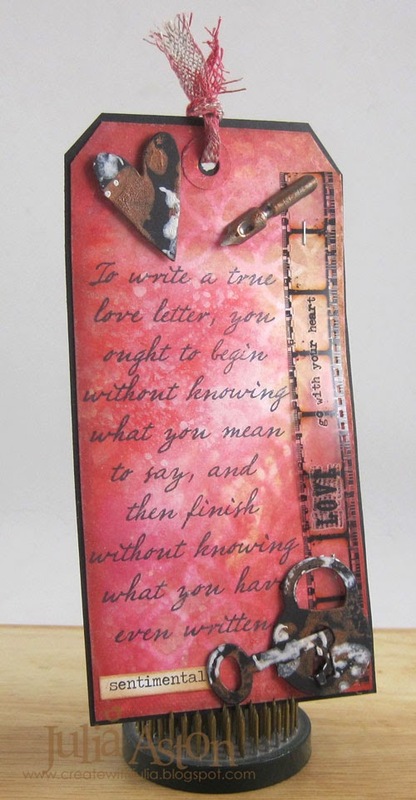 I have used my stains in several ways; marbling, stencilling and a little painting. Do hop over to Addicted to Art to see the details. What a fun challenge Annie has for us today! This is a great way to make us use all those products we have in our craft rooms - maybe some we don't usually grab first. I decided to use Ribbon/Die Cuts/Stains on my creation, getting out my Compendium of Curiosities Vol II to help me to use stains creatively. 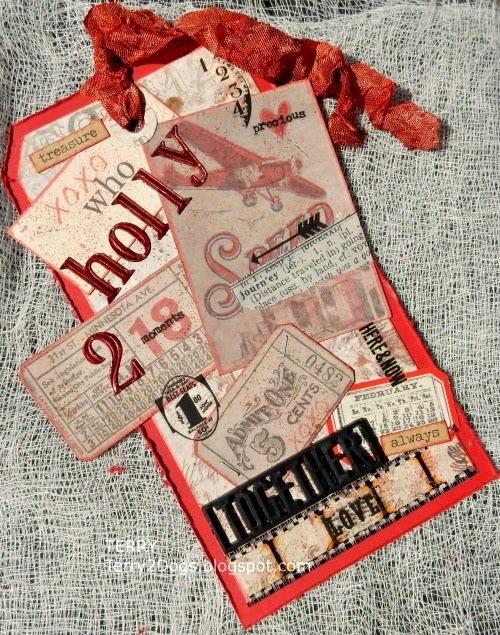 Please stop by my blog, Create with Me , to see just how I put my Tic Tac Toe Tag together! Inspired...........then lets see your amazing entries. 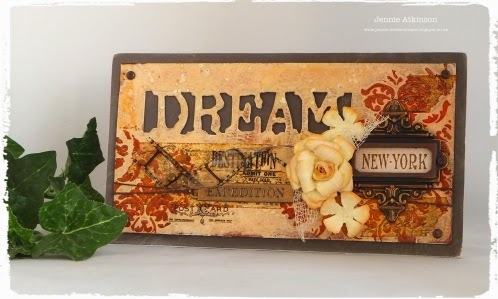 We are a Tim Holtz inspired blog, however, you do not have to use Tim Holtz or Ranger products. Just let us know how you were influenced by Tim's style and of course which grid you have chosen in our Tic Tac Toe Challenge. We are looking forward to viewing your creations and you have until the 19th February at 18.00pm to take part. Please use the inklinkz link below to attach entries. Before we go we would like to give you a heads up there are some changes afoot here at AVJ. On March the 6th we will be celebrating our first birthday and we will have a special challenge and some prizes for you. The most significant changes will be a move to a monthly challenge theme with a gift voucher of £20 from Country View Crafts. In future the winner will be chosen by Random Org but we will continue with our Top 3 Pinworthies and our Pinterest boards. The structure for the month will change and Fridays will very much be about projects and guests and Mondays will hold a completely new format of Destination Inspiration posts linked to a monthly menu of a product, a colour, a technique and a substrate. Mix those four things with four Creative Guides and there will be some wonderful informative posts for you. Some of the months will include five weeks and when this happens you will see the return of our very popular Tag Fridays. So stay tuned and keep the date in your diary - don't forget the 6th March, but for now enjoy our current Tic-Tac-Toe challenge. Such a fun challenge Annie - and so many inspiring projects for the Creative Guides - each so different even though many of the same products were used! A fabulous array of projects here with so much inspiration. I am blown away by all of them and hope you can all take part in the challenge. Stunning makes from everyone!! Hoping to get round to all of you soon! Such a fun challenge, Annie - and as usual the team have done wonders! Great projects from everyone. Looking forward to visiting all your blogs and seeing what all our followers come up with for this challenge. Sounds like fun and what great inspiration from the DT as always! Great inspiration, Creative guides! Annie, what a fun challenge! Looking forward to the new format and happy to continue my vintage journey with you. Super samples from the Design Team yet again. I love how people can use the same 3 things and yet every creation is so different. I was just thinking how incredible it is to see one after another MAGNIFICENT creation that is near perfection on this site. Seems like I visit alot of sites that have a list of projects like this and there might be one that I love and another that is good! But here... it's just boggles my mind how each one can be so special... and... that there is a link to help us learn from each one too. Thank you so much DT for all the time and effort you put in for the ones of us that are still trying to learn! Happy Valentine's Day! j. As usual a ton of inspiration from the design team! Beautiful projects by everyone this week and I had a load of fun playing along!